I’ve done plenty of reviews on amateur radio gear, but sometimes there are times when you will want to use an unlicensed radio service. If other people in your group are unlicensed or you are looking for a more casual operating environment, the FRS or Family Radio Service may be just the thing for your communication needs. 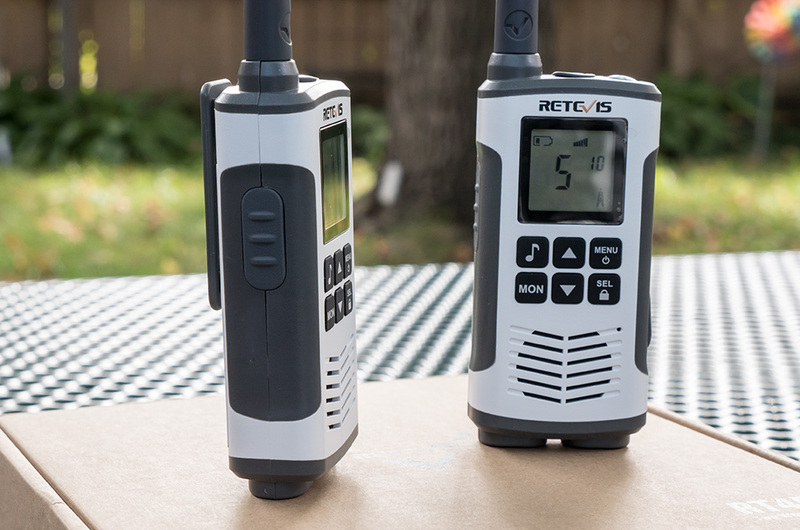 The Retevis RT45 handheld radio is billed as an entry level outdoor license free two way radio. the RT45 is FCC certified for the FRS or Family Radio Service in the US, so you can use it without any need of a radio license. Opening up the package you receive two radios, Nickel metal hydride rechargeable battery packs, a household power to USB transformer and charging cable with is capable of charging both radios. Since the radios use a 5 volt USB connection for charging, you can also use your computer’s USB port or your USB charging accessories from your phone to charge the radios. After installing the batteries and turning on the unit, you are greeted with the volume level. You can adjust the volume by pressing the up and down buttons. Pressing the menu button lets you pick the channel selector, privacy codes or CTCSS tones, Vox operation, and call tones. The radio has 22 channels and 121 privacy codes so you have plenty of options in finding a channel and code for not interfering with other users. Fit and finish is nice, the radios come in white with rubberized trim, so they are easy to grip. There’s a flashlight on the top, toggled by a side button, and a headphone jack on the top of the unit. There is no facility for a speaker mic, and since the radios are for the Family Radio Service, the antenna is non-removable. A couple of other interesting features are the Vox or voice activated operation. You can set one radio up with Vox as a baby monitor- so you can catch up around the house while the kids are napping. The radios also have a dual watch function so they can monitor two channels at the same time. That might be a handy feature if you are with a larger group and they are running two channels. The radio has 500 milliwatts of power, which is common for FRS radios, so you can expect the range to be about a mile or so in typical circumstances. I took the dog for a walk in the neighborhood and I had no problem communicating within a 1/2 mile radius. Bottom line, for an FRS or Family Radio Service Radio, the Retevis RT45 handheld FRS radios are a step up from the blister pack radios found in the discount stores so they should serve you well for your outdoor adventures. Thanks for the detail run-down, Michael! According to FCC ID 2AAR8-RETEVISRT45 test report, these radios were tested (under Part 2 and Parts 95A and 95B) with a maximum output of only 187.5 mW ERP. The manual refers only to “Output power：≤0.5W”, without actually saying they are nowhere nearly that powerful. Do not be surprised if the “reach” of such units is less than those using output power closer to the authorized limits (i.e., 500 mW on ch 8-14 and 2W on the others). Also worth noting that “privacy codes” actually increase the chances that you will interfere with others, as you cannot hear them (and wait to talk) unless they are using your code, but your transmission will go out on the channel, regardless of whether it is already busy.